There's a tui in our teapot. He's looking out at me. 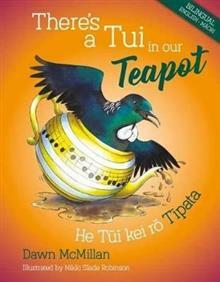 A tui in the teapot? Yes ... he wants a cup of tea! A tui and his various friends including takahe, kea, korimako (bellbird), pukeko and hoiho (yellow-eyed penguin) invade the family kitchen, getting up to all kinds of high jinks and making a tremendous mess! What will Nan say when she sees what the hilarious gang of mischievous birds have done to her kitchen? Dawn McMillan is an internationally recognised writer of children's books who lives north of Thames. Among her many popular works are I Need a New Bum!, Why do Dogs Sniff Bottoms and Colour the Stars. Nikki Slade-Robinson is an award-winning children's illustrator and author who lives in Opotiki, known for titles such as Muddle and Mo and The Seven Stars of Matariki. Translator Ngaere Roberts is a teacher and well-regarded speaker of Te Reo Maori.